Logic of English is a language arts curriculum program for all ages. It is divided into two levels: Logic of English Essentials for students ages seven and up, and Logic of English - Foundations for students ages four through seven. Foundations focuses on phonemic awareness and early writing skills, and is further divided into three sections. 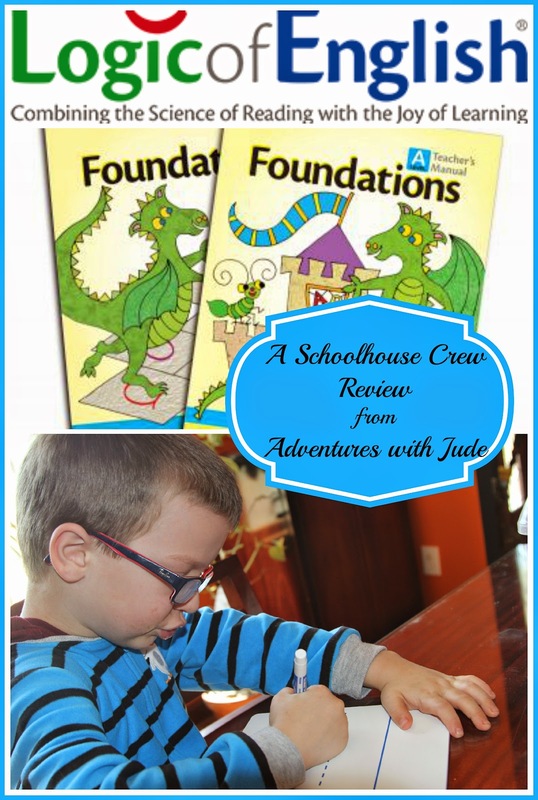 We received the Foundations A program for Jude to work with. 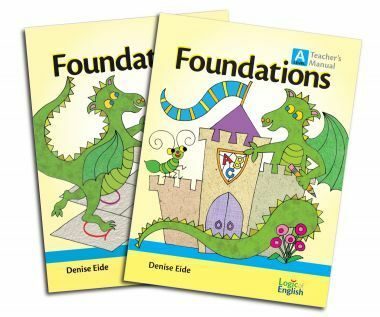 The three core texts are the scripted Teacher's Manual, the student workbook (available in both manuscript and cursive writing), and the book Doodling Dragons: An ABC Book of Sounds ($71, all necessary printed texts). We also received The Reusable Resource Set. 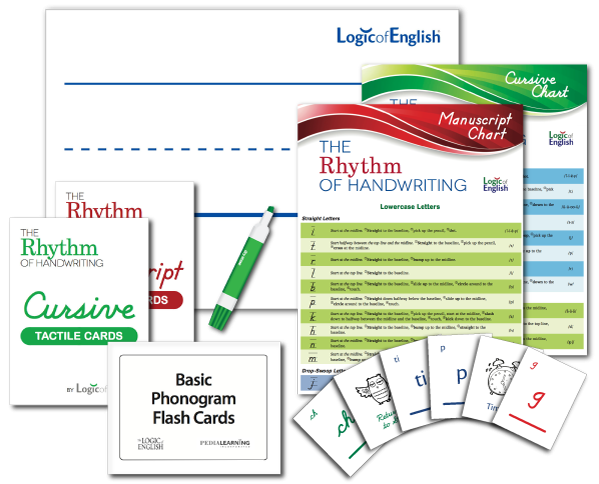 This $85 package contains Basic Phonogram Flash Cards, Handwriting Tactile Cards, two sets of Phonogram Game Cards, the Rhythm of Handwriting Quick Reference Chart, and a small Student Whiteboard. The package contents are also used with Foundations Programs B and C). Language and reading are a struggle for Jude. I've lost track of how many programs we have tried already, plus we intentionally took a six month break from formal reading lessons. His most recent course of speech therapy started in August, and his therapist (Miss Jaime) and I agreed that before he could learn to read, he really needed to get stronger expressive language skills. Because we are coming to the end of this round of therapy (the clinical model is to alternate intensive therapy with periods of rest in order to allow the child to practice skills and avoid burning out), we decided it was time to start re-attempting a reading program that might help him keep up with the skills he's been learning in therapy. One of Jude's weaknesses is articulation. For example, to him, the words "mud" and "mug" come out the same. Being able to read a word doesn't mean anything if you don't know what the sounds you are saying mean - even if he can figure out the word on the page is "mug" it makes no sense if his brain is saying "Why are you pouring the root beer into the mud?" For speech purposes, we needed a program that was phonemic based to help him work on sounds both in isolation and words. Miss Jaime wasn't familiar with Logic of English, but felt that as long as it was truly phonemic based (vs. "a little phonics and then ultimately memorizing the words"), it was worth a shot. Our philosophy was if it helps him read, great, but right now, let's work on knowing what word you're saying. After our books arrived, I took them to one of our therapy sessions, and she worked on one section with him. She was very pleased with the program, so that was the first point in it's favor. She was honest and agreed it was going to be a lot of work for him, but it was definitely compatible with our overall language goals. We both liked how short each lesson was (less that ten minutes). For a child with a low frustration threshold, keeping lessons short helps. However, one thing she was concerned about was the pace of the program. 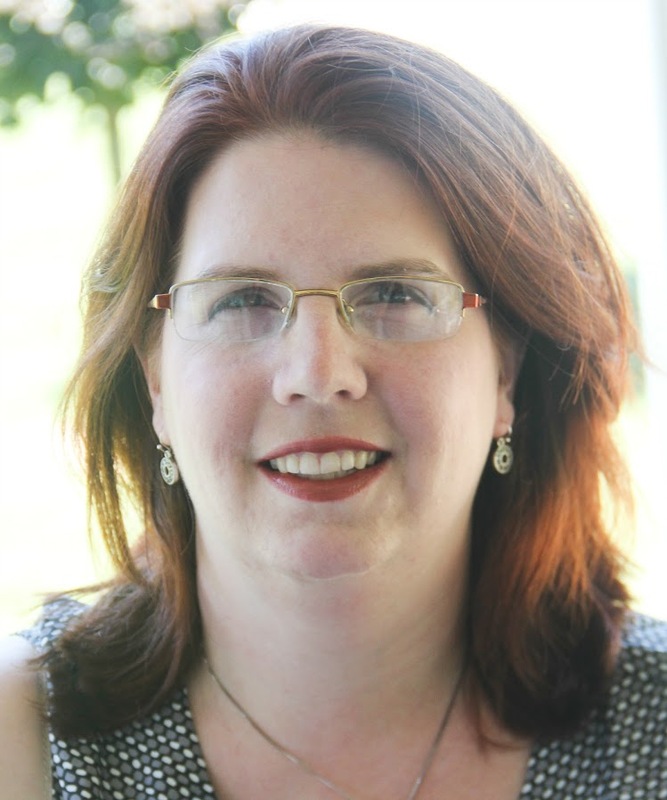 For a neurotypical child, the lessons were a suitable pace. However, Jude has some serious language deficits, and needs a lot of modeling. She was concerned that he could fake his way through the harder-for-him parts. For example, blending individual sounds together was something that would be difficult for him to do on his own, but if we practiced enough times, he would just memorize the patterns, not blend the sounds. I agreed with her (for all of Jude's irregularities, this is definitely one behavior that occurs nearly all the time), so we approached this a little differently. While most students would be able to complete a lesson a day, we were definitely going to have to go at a slower rate. We repeated lessons several times, often rearranging the words so he didn't have the pattern to support him. At the end of the six weeks' review, we are actually only at Lesson 8, having spent almost two weeks just on Lesson 3. It took him three days to be able to hear sounds in isolation, and then about eight school days to be able to put the blended words together. Between listening, motor planning, and making the sound, the words were just a huge struggle for him. I don't think it was that the words were inappropriate -- after four days of getting nowhere, this was one of the lessons Miss Jaime looked over, and she agreed that they were reasonable words. It just was Jude's brain not keeping up - we just needed to keep trying. In order to keep them fresh, one day we would start at the top of the list and go down, another day we'd go in reverse. I'd mentally number the words, and one day we'd do evens followed by odds, or odds followed by evens, just so that he didn't learn "say cat then pig then dog," and really had to work to put the sounds together. She also wanted us to use her criteria for "success" - 90% accuracy, three consecutive sessions. We were all thrilled when Jude hit that...I think by week three of the same words, we were all tired of those words! The Teacher's Manual is very well scripted. Foundations is supposed to "[Equip] teacher to combine the art of teaching with the science of reading." This definitely is true here. For example, the terms used are speech science based - using the terms voiced/unvoiced for sounds, explaining pronunciation (/k/ means "say the sound, not the letter"), and explaining the location of the sound and the placement of the mouth/tongue/teeth. 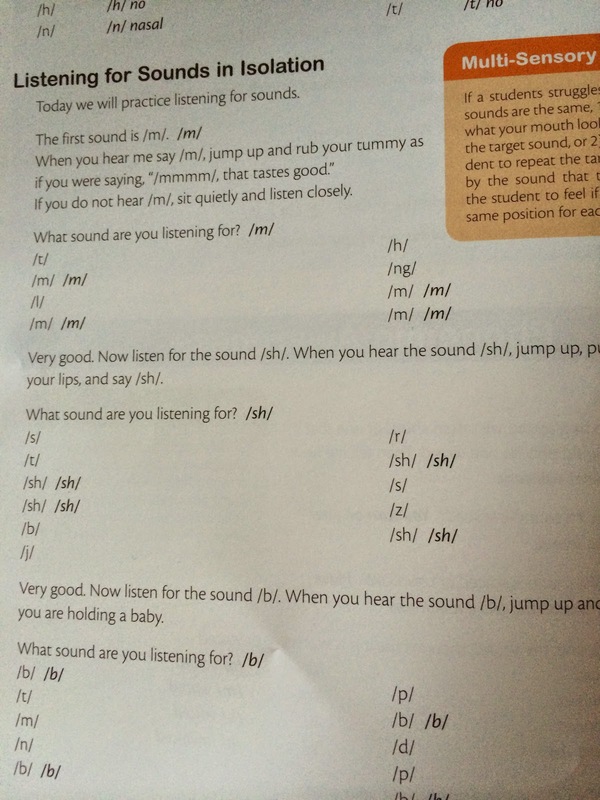 While this is not going to be an overall substitute for Jude's speech therapy, it is definitely a great "between" program that builds on familiar-to-him language. If you are a parent/teacher with little/no speech training, it is easy to understand - while using "therapeutic" language, it's not so full of jargon that it becomes overwhelming. There are 48 lessons in all - 40 "new material" lessons along with a "review" every fifth lesson to make sure that the student has learned the skills being taught (it's much easier to go back and repeat one or two lessons than try to figure out after Lesson 30 that he didn't quite catch all that was in Lesson 12). Each lesson combines listening and repeating sounds, focusing on blending sounds into words, and then learning the proper strokes for writing. One thing we both were impressed with was that it actually started with listening. Before the child even begins putting oral sounds together, the lessons start with blending two words into compound words. The parent/teacher begins by saying two individual words, pausing between each, and the child looks at the provided images to decipher what the words become when combined. 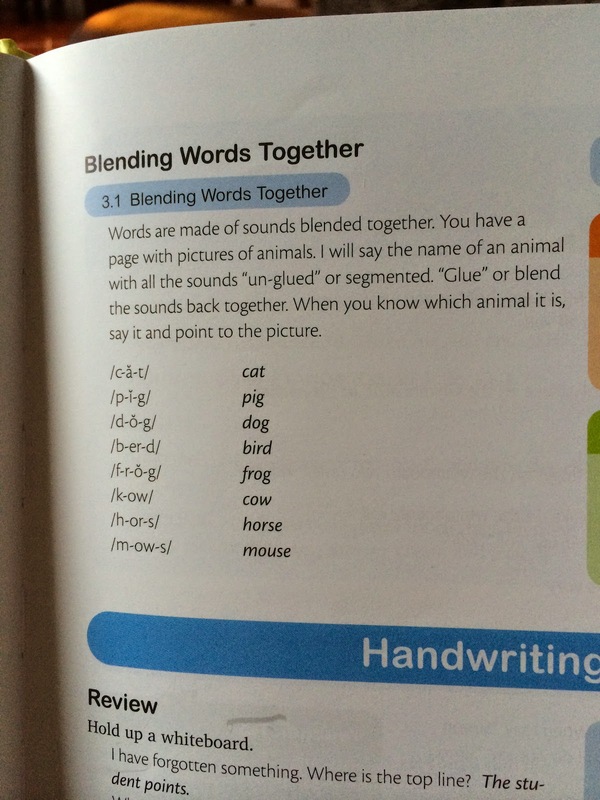 Using familiar words and images, the child learns that "sounds go together." For Jude, who tends to drop middle sounds, this was a perfect exercise. He could hear, and eventually repeat, all of the phonemes contained in the word. For example, one of the blends was "butter" and "fly." Instead of saying "bu er fy" he was starting to recognize that there are /t/ sounds in the middle of "butter." In general speaking, he tends to garble the /l/ sound and now will say the last syllable as "fwy" but with intense focus on the syllable structure will now say "but ter fly." For him, just recognizing there are sounds in the middle is huge. We have been using the Manuscript Workbook I was torn on which to go with - cursive is supposed to be easier for children with motor skill issues, but Jude's occupational therapist has been focusing on printing with him, because it forces him to be more aware of spacing and line limits. In order to reinforce the same skills, we opted for manuscript. Unlike other programs we have used, it doesn't begin with "write this letter" but instead with component strokes. This is where the whiteboard was really useful. While the workbook has a space for practicing strokes and letters for each lesson, I found that using the whiteboard helped keep the book "empty" until we were ready to move on from the phonemic section. 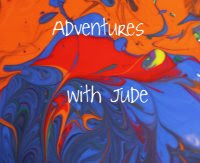 Once Jude mastered how to do the sounds, he was very proficient with the strokes/letters. Yes, the penmanship in his book may be a bit "artificially" beautiful, but using the board kept us from the "but I already DID this, I want to move to the next page" fight. Though the set comes with a marker, I purchased a set of dry-erase markers, so that each day we were using a different color. This helped keep it different as well ("We haven't done orange yet!"). Some days, instead of actually pen-and-paper work, we worked with the Tactile Cards. This program is definitely flexible enough to accommodate many students' paces. Due to copyright issues, we were unable to copy the workbook pages. Therefore, instead of circling the images on the first go-around, Jude would simply point to them. Circling was an "earned" privilege - once he had achieved oral proficiency on that blend, he got to circle it. While we haven't worked directly with Damien, just being around as we work on things has helped his speech as well. He is also a patient of Miss Jaime - he receives feeding therapy from her, and she also has been monitoring his speech. (He has not yet had a formal speech evaluation for therapy, but she keeps tabs on his progress so that if we find he does need it, he will be able to start as quickly as possible.) She has definitely noticed his articulation getting better -- at the start of his current round of therapy, we discussed ending the block with a full speech evaluation. We've since decided that his speech has gotten strong enough to not warrant testing! I'll likely use this program with him in the fall as well, because it's clear that it's working for him, even indirectly. I will admit, this program is not going to be a "magic bullet" for Jude. Frankly, I don't think any program is going to be -- he just needs a lot of time and practice. However, of all the programs we have tried, so far this has been the one that has worked best for his disabilities. We are able to control the pace of the program, from how much is presented at one time to how quickly we move forward. While each lesson has a small number of sounds/words to work with, keeping him from feeling overwhelmed, there are enough to be able to mix them up so Jude can work on learning the sounds of the words, not the pattern that they are presented in. He is about to be discharged from speech therapy for the summer (we will take about three months off and then start up again in September), and this is a program that I feel will definitely help reinforce concepts that he has been working on in therapy. Clearly, the Level A program alone is going to take much longer than average - I'll be shocked if we complete it by September - but I think that it's a program that will work for Jude when taken at his pace. Crew members have been working with a number of Logic of English curricula from both programs. Click the banner to read about the other products reviewed.